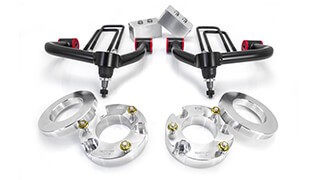 Made to fit 2015-2019 Ford F150 4WD. 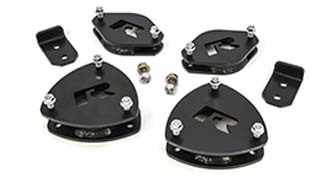 Complete front/rear lift kit system featuring RCS - Rack Correction System. ReadyLIFT 7" Complete Lift Kit System is made to fit the 2015-2019 Ford F-150 4WD trucks and gives you MAXIMUM lift. ReadyLIFT offers the best comprehensive lift kit designed specifically for 2015-2019 Ford F150 4WD trucks. 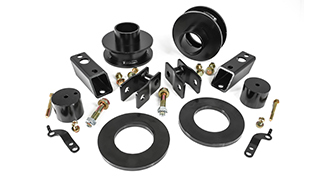 The complete big lift kit systems feature the absolute best design and components available. If you want max lift for your Ford F-150 that maintains the factory ride and steering geometry. 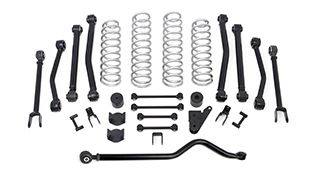 The premium complete 7.0" front / 5.0" rear 2015-2019 Ford F-150 4WD kit is specifically designed to give you maximum lift and rugged off-road strength while maintaining the factory ride on the street. 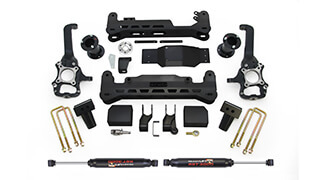 The 7" lift kit features precision-designed laser-cut and CNC-formed subframe assemblies that directly bolt in. Welding is required for one section which attaches to the frame. Includes heavy duty cast nodular iron steering knuckles, patent-pending rack-and-pinion steering drop correction system (U.S. Pat. App. No. 14531073) and an integrated differential drop bracket system to ensure correct CV axle angles and maximum performance in 4WD mode. Patent Pending fabricated industry first offset steel strut extensions (U.S. Pat. App. No. 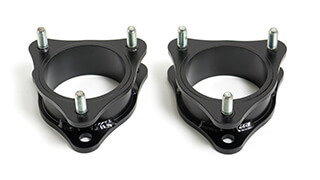 14532783) provide the Maximum 7" of front lift while 5" tall OEM-style rear blocks (total rear lift equals 4.0" of lift when installed) provide a quality rear lift that doesn't sacrifice the ride. 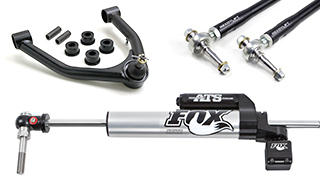 This kit even includes a Patent Pending steering extension to keep your steering performance like factory. This is a no-weld design - direct bolt-on installation. 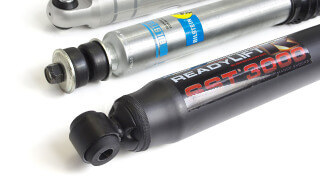 This system also includes a patent-pending RCS - Rack Correction System - steering extension design that works with the relocated steering rack to retain the stock steering geometry. That means No Cutting or replacing the tie rod ends like on some other kits on the market. Why is not cutting the tie rods important? If the owner or mechanic replacing a tie rod down the road doesn't know a tie rod has been cut and shortened, they will install the OE replacement tie rod which will not work and the vehicle cannot be properly aligned. That is just one reason why a dropped rack and pinion is far superior. By dropping the steering rack the truck retains full OEM alignment specs, features a stock vehicle turning radius and retains the stock track width! 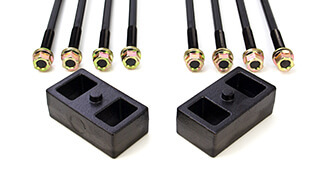 This system even uses factory style cam plates and can be aligned to within factory specifications. 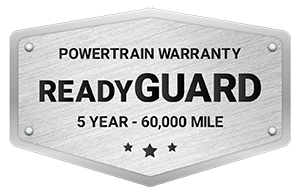 We even included details on the ideal alignment specs to prolong tire life and increase the performance and handling both on and off-road. 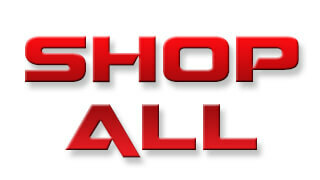 Run your stock wheels or most 17" or larger aftermarket wheels: Wheel Width: Stock Wheels OK or 9" wheel w/ 4.75" - 5.5" BS. 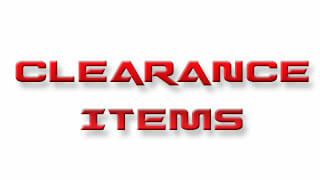 Trucks with 2-piece drive shaft, please contact 877-759-9991 for rear upgrade solution. 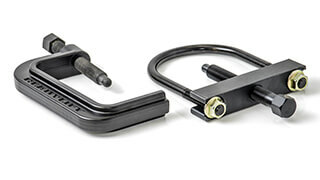 7 inch lift strut extensions - 5" rear lift blocks.